Crazy Police Car is an arcade game on www.bestgames.pk in which you are a crazy driver in a black police car. You steer the car in a green road with several trees growing at the two sides of this road. The road has two dividing lines. You will encounter many other cars blocking your move. So you have to avoid them or jump over them by using the space bar. Your goal is to finish 5000 kilometers’ route within certain time. In level 1, you will be given 30 seconds to finish it. And at level 2, only 25 seconds are given. You must drive as fast as possible. Press the left and right arrow keys to steer, the up and down keys to control the speed. Avoid hitting other cars for it will greatly affect your moving speed. You will have to restart your car. Are you ready for a crazy trip? Join now! Play free game Barbie Car Drive on bestgames.pk. Barbie Car Drive is a girl game provided to you by www.bestgames.pk. Join this free game to help cute Barbie to drive her pink fancy car. Drive the car forward with the up arrow and tilt with the left and right keys. Collect the bonuses along your way forward. Drive careful in case of toppling the car. You have three lives in each game. Score depends on your performance. Now, let’s start! 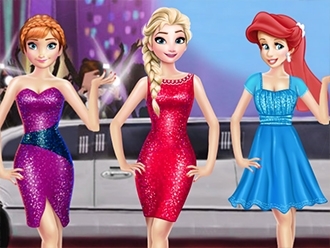 Prepare our three princesses for the movie awards event tonight!Pick the best fashion outfits for them,your their personal fashion stylist.With your help they will shine on the red carpet.Enjoy! Help Princess Aurora take care of her baby girl. Give the baby a bath, change her diaper and dress her up in a cute outfit. Aurora and her baby will be very pleased about you helping them. Have fun!